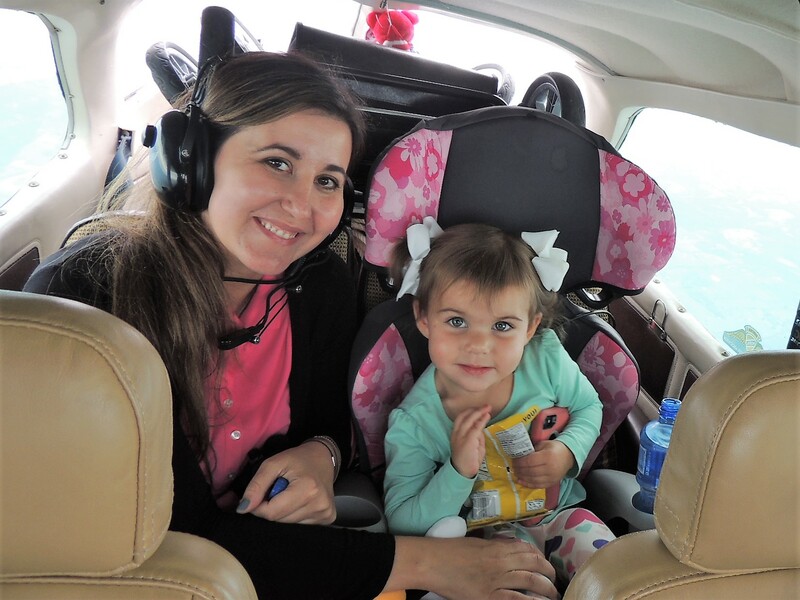 Our passengers for today’s Angel Flight were two-year-old little Miss Madison and her mom, Jackie. We were leg two of their two-leg flight that originated in Beckley WV. Leg one was from Beckley WV to our home base, Luray Caverns Airport, and it was flown by Angel Flight Pilot, Gary Garavaglia (Gary is based in Statesville NC). From our home base, we flew Madison and her mom to Philadelphia International. Madison would be having surgery at the Children’s Hospital within the next several days. Little Miss Madison was absolutely adorable with her great big smile and a “thumbs up” when asking her how she liked the flight! We are scheduled to return them back home next week (we are going to fly both legs) and we are very much looking forward to seeing her again after her surgery! Our flight up to Philly was very smooth at 7000 feet with a very nice 35-knot tailwind moving us over the ground at about 185mph, we would pay for this on our flight back home! As we moved northeast over the mountains, we had a cloud deck below us for the remainder of our flight to Philly. We made an instrument approach into Philly International, coming out of the clouds at 800 feet with runway 27R waiting right there ready for us to land! Little Miss Madison occupied herself very well on our flight up and I believe she really enjoyed it….. at one time I looked back and noticed her looking out the window with an expression of amazement! Once in Atlantic Aviation, Madison and her mom Jackie were quickly shuttled away to their rental car that was on standby….. but not before we had our group photo and said our goodbyes (actually not goodbye, but see you next week) because we are scheduled to return them home after Madison’s surgery. It was certainly a pleasure for us to fly such a sweet and brave little lady, we are hoping for the best possible results from her planned surgical procedure! On our flight back home, we did indeed pay the price for the nice tailwinds we had on our way up….. we had even stronger winds (40-50knots) that were now on our nose, keeping our ground speed down to double digits only! So while we slowly flew back home we were able to take our time enjoying our I.A.P. (In Air Picnic), all the while, taking in the wonderful views from our office windows! Back at home base, we made a visual approach and landed on 22 with some fairly strong winds straight down the runway. As I tucked 49Bravo back into her hanger, Captain John was busy making our coffee, which we enjoyed as we departed on our most dangerous part of the day….. our drive home! Following are some photos of today’s Mission…. Have a Great Day! The lower, broken clouds turned into a solid deck below us. Madison looking out at the clouds below us. Walking into Atlantic Aviation at Philly International……. no, that was not our ride! With Madison and her mom Jackie, safely in Philly. 49Bravo, waiting for us to fly home. Waiting for traffic to pass by as we are holding for take-off. Departing Philly International headed for home. What an adorable Mother and child…Barbara B. A couple of charmers on this flight. I would like to know how Miss Madison made out. What number flight was this for Capt John and for Nevin? Hi Tom! We are flying little Miss Madison back home tomorrow (Oct 22nd) Her mom told us that her surgery went well! This flight must have been more difficult than one would realize. Well disciplined pilots, Nevins and Billings. God Bless the little girl Madison and her mom, Jackie. Little Miss Madison was a sweetheart! Tell Elaine we said hi, and I know that little puppy will have a great home! I love all your flight stories and precious folks you take care of, but oh! this one in particular just melts my heart strings! I know, she certainly melted our hearts as well!